Ryan Pedersen April 12, 2019 at 7:34 pmClear! Brian Jones April 10, 2019 at 6:50 pmTwo trees across the trail between COD and Grand Slam. There is another one that needs branches trimmed after those two. I'll get that one in the next few days. There is another one between GS and Phils that needs saw as well. Appreciate the trail love!! Saw gravel bike tracks... Really!!?? Watch the ruts folks!!!!!!!! Bruce Bradshaw May 21, 2018 at 7:55 pmDusty. Marty Dawson February 8, 2018 at 7:20 amRode COD from Estrada, ELV to Expressway to the Chicken down Phil's to Marvins and back to COD and Estrada on Feb 7. Very nice. A few minor wet spots but no longer soft enough to rut. Bruce Bradshaw June 8, 2017 at 8:28 pmA few puddles. Grace Ogawa March 29, 2017 at 8:02 amRode this yesterday (March 28) from COD to Expressway/Grand Slam. 100% ridable with no snow and only one puddle of note. PS the Expressway section (marked here as ELV) from Grand Slam to the Flaming Bird (Phil's) junction is also good to go. There’s a pretty well known coyote den in the area of ELV and Grand Slam — and we got a report that at least one coyote is getting to be pretty big and starting to stand its ground when confronted. It’s rare that they will act aggressively towards a human, but they are known to attack dogs, so beware. Follow this link to learn more about coyotes. E.L.V. is the mountain biking trail named after Eric L. Vickers, past president of COTA. E.L.V. runs from the intersection with Phil’s trail at the Flaming Chicken, out to C.O.D.. It crosses Grand Slam trail about half way. 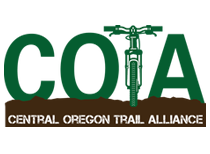 This trail is maintained by Central Oregon Trail Alliance. If you’ve taken some pix and want to share ’em, email us and we’ll give you a photo credit. Please only send images which you’ve taken. Before heading out, please take a minute to look at the Rules of the Trail. More pix @bendtrails and #bendtrails. Two trees across the trail between COD and Grand Slam. There is another one that needs branches trimmed after those two. I’ll get that one in the next few days. There is another one between GS and Phils that needs saw as well. Appreciate the trail love!! Saw gravel bike tracks… Really!!?? Watch the ruts folks!!!!!!!! Rode COD from Estrada, ELV to Expressway to the Chicken down Phil’s to Marvins and back to COD and Estrada on Feb 7. Very nice. A few minor wet spots but no longer soft enough to rut. Rode this yesterday (March 28) from COD to Expressway/Grand Slam. 100% ridable with no snow and only one puddle of note. PS the Expressway section (marked here as ELV) from Grand Slam to the Flaming Bird (Phil’s) junction is also good to go. There’s about 10 small sections of snow between COD and the junction with Phil’s, 95% ridable with a few hike-a-bike sections. Should be good to go by next weekend. According to the COTA signs, what is shown here as the north end of E.L.V. is actually Expressway. E.L.V. ends at the junction with Expressway and Expressway continues to the Flaming Chicken. Thanks Bruce. We will get fixed as soon as we can. Please log in or join to post a comment.